The prize of Best in Network Support Solutions went to Phybridge for its CLEER (Coax Leveraged Ethernet Extended Reach) switch, the world’s first enterprise grade 24-port Ethernet over Coax switch. This could not have come at a more opportune time as we’re introducing our highly successful Power over Long Reach Ethernet (PoLRE) technology to the security industry. 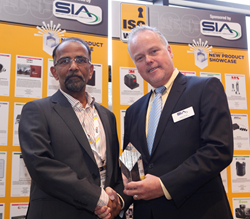 The CLEER Switch from Phybridge won the Best of Network Support Solutions Award at the Security Industry Association’s 2015 New Product Showcase (NPS) awards ceremony at ISC West earlier this month. The Security Industry Association (http://www.securityindustry.org) is the leading trade association for electronic and physical security solution providers. SIA protects and advances its members' interests by advocating pro-industry policies and legislation at the federal and state levels; creating open industry standards that enable integration; advancing industry professionalism through education and training; opening global market opportunities; and fostering collaboration with other like-minded organizations. As a proud sponsor of ISC Expos and Conferences, and owner of the Securing New Ground Conference, SIA ensures its members have access to top-level buyers and influencers, as well as unparalleled learning and networking opportunities.